Yes, that's right. I was one of several Santa Barbarians interviewed on how we use Twitter for business and pleasure. Great article, which unfortunately is behind a pay wall, so I won't be posting a link here. And I don't yet have permission to reprint on my site. Will let you know when that happens. Here it is! 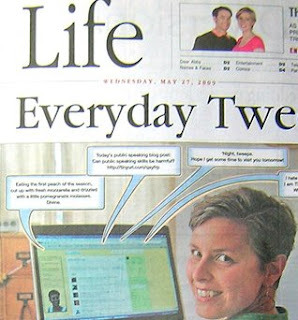 In the meantime, check out the whole TwitPic of the front page of the Life section. I've never been so huge before -- literally!